Stopping the Violence. Invest in the neighborhoods. Today's front page story in the Chicago Tribune focused on the increasing use of rifles and assault weapons by gang members in Chicago. It's a terrifying escalation of a long-festering problem. I've been following these stories for over 30 years, as some of the media stories shown at the left, illustrate. If you open the "violence" tab on this site you can scroll back through 10 years of stories. In all of these I've proposed non-school tutor/mentor programs as a prevention strategy, not as a stop-the-shooting strategy. 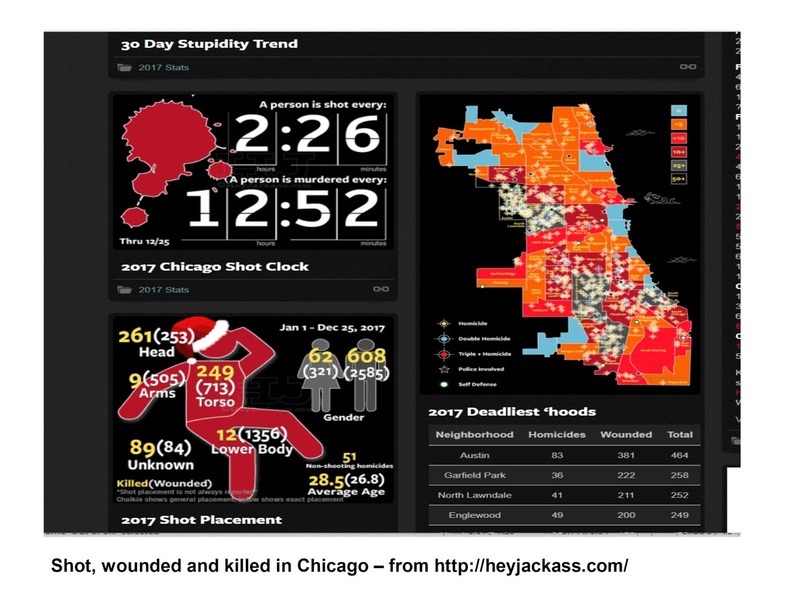 If you're concerned about this problem, here's a web site that provides a running score on the shootings and homicides in Chicago. It's aptly named "Hey Jackass". While homicides and shootings in Chicago were much higher in the 1980s and early 1990s, there have been a steady flow of shootings and deaths, every year for the past 35-40 years. The violence of the past few years actually distorts a reality that overall, crime is on the decline. I started leading a non-school, volunteer-based tutor, mentor and learning program in 1975 and continued to lead such programs through 2011. I've always advocated for a program model that drew volunteers from different backgrounds into the program, and into the lives of kids and neighborhoods. 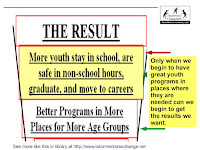 This model depends on programs being able to sustain themselves for many years, so a youth joining in middle school years can stay involved through high school...or for six to eight consecutive years. That's why much of my four-part strategy focuses on public education and drawing needed resources to programs. What troubles me is that when a shooting takes place, I have difficulty offering tutor/mentor programs as a short term solution that would motivate a youth to leave a gang, or choose not to pick up a pistol, or rifle, and get in a car with the intent of going out and killing another person. I created this graphic to illustrate what I propose as a long-term solution, with short term actions. This arrow shows a timeline of birth to work, which stretches up to 25 or 30 years for some people. When a shooting takes place, involving a young person between the age of 16-34 (with victims much younger and much older), the immediate response is triage. How do we get the guns off the street? 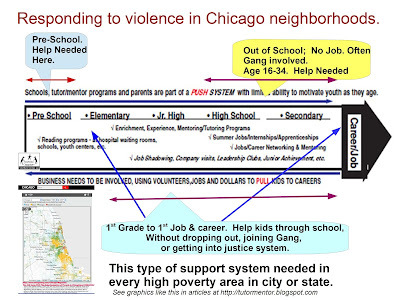 How do we get kids out of gangs? Or how do we get gang members to stop shooting, wounding and killing each other? How do we heal the wounded, or counsel the relatives of the dead? How do we help kids focus on school and their future when they don't know if the next stray bullet will hit them? That's the yellow highlighted portion of this timeline. Dr. Gary Slutkin and CureViolence offer an answer with their program. Earlier in 2017 I pointed to a WBEZ story about the cost of a jobs program targeting boys and men in high violence neighborhoods. Read it here. However, if we only invest in programs focusing on the people in the high risk pool, or in gangs and the justice system, we're going to be dealing with this problem many years from now, because we've not put in place a prevention strategy intended to reduce the number of young people who go into this risk group. On the opposite end of my timeline are advocates for robust pre-school programs (highlighted in light grey). Dr. James Heckman, a Nobel Prize winner in Economics, posted this Tweet, saying the "achievement gap starts at birth". Voices For Illinois Kids has been an advocate for early childhood programs since the 1990s. I encourage you to dig through their web site to find ideas and resources. Look at the data offered in the KidsCount data book, published annually. If we build strong pre-school programs and strong re-entry and opportunity youth programs, we've addressed both ends of this problem, but still need to address the support kids in high poverty and distressed situations need from first grade through high school, post high school and into adult jobs and careers. In the hub-spoke graphic I posted above, I describe a strategy where a youth program, or a school, are places where kids connect with adults, experiences and support systems that extend far beyond what they normally see in their family or neighborhood. 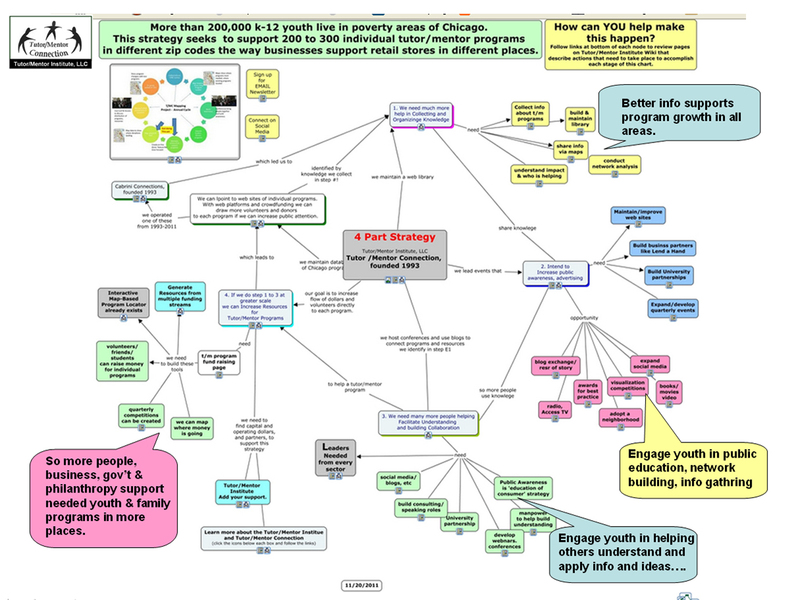 This strategy presentation (PDF) visualizes that idea and shows the role of business and professional groups to help make such learning opportunities available in every high poverty neighborhood. 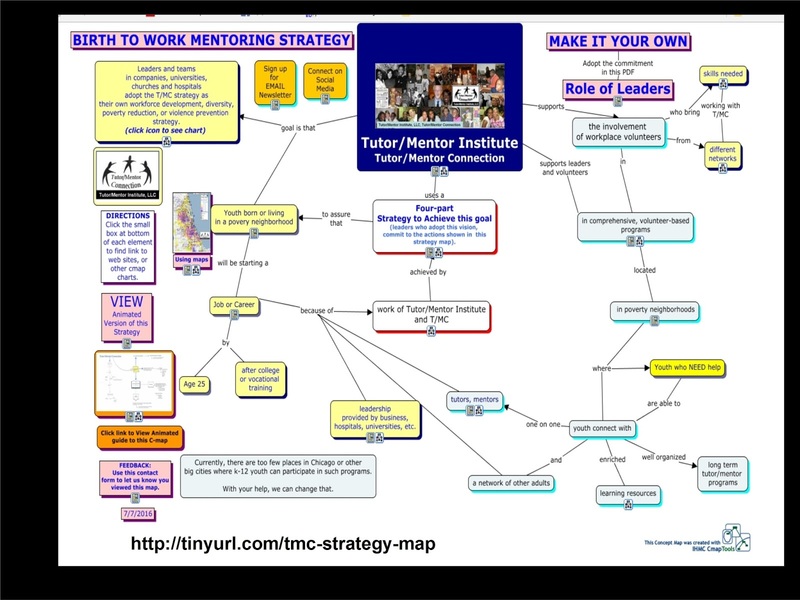 In the Tutor/Mentor web library you can find links to dozens of different types of youth serving organizations. Each could provide ideas that might be duplicated in other places. You just need to spend time looking at these sites. I've been writing stories like this for more than 20 years, but too few people are reading and responding. 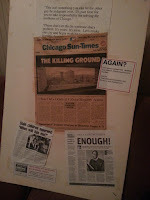 Thus, I'll end with another tweet, where a young Chicago women is calling on adults to provide the resources kids need to grow up safely and become part of the American dream. I hope you'll take some time over the next few weeks to open the links, view the videos, and then share this and other articles I write with people in your own networks, in Chicago, and in other cities throughout the world. 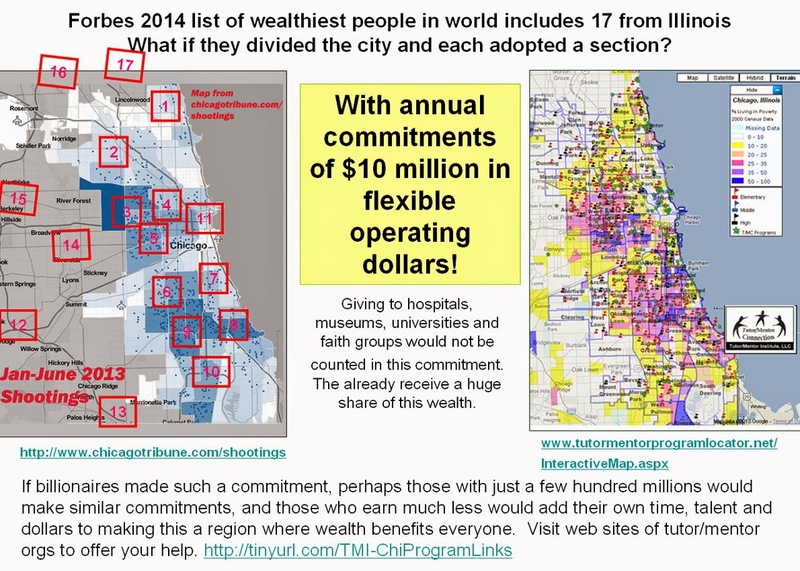 Note that in the graphic I posted above I included a map showing poverty in Chicago. Here's a different version. 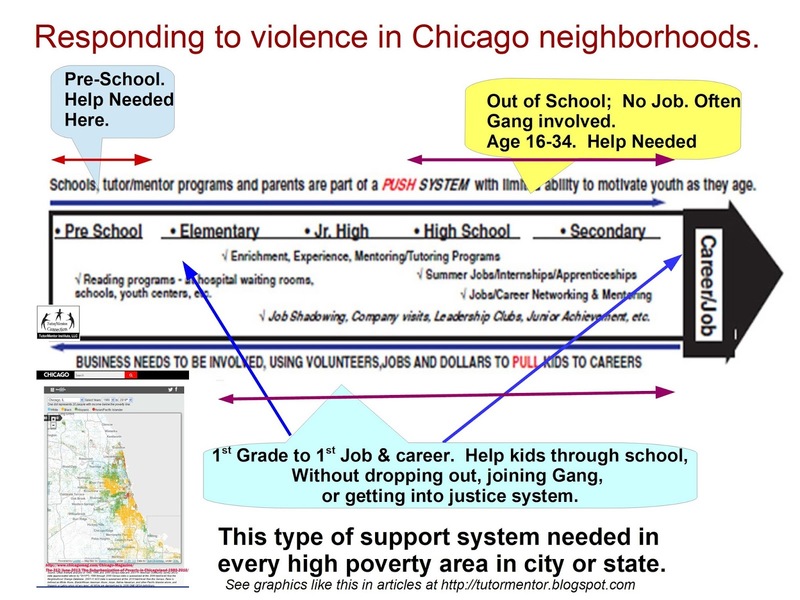 Youth support systems need to be fully available in every one of these neighborhoods. You can't have some pieces on the North site, some on the West side, few on the South Side, etc. and expect the system to deliver the outcomes you want. It will take the consistent, long-term involvement of people from many sectors to build and sustain this system and make it available in every high poverty neighborhood of every city and state in America....as well as in other countries. Ideally, people would have started building this system 25 years ago. The next best time to start is NOW. If you value what I write please make a contribution using the PayPal button on my "go fund me" page. Click here. 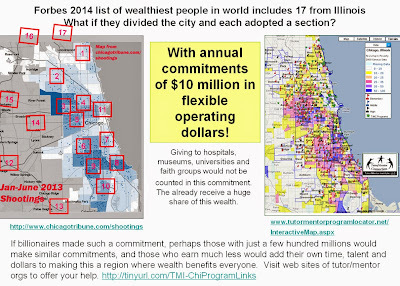 Work Together To Solve Chicago's Problems? Maybe. Common Goals? Yes. I've been seeing some high profile community leaders post articles calling on people to "work together" to solve problems of Chicago. While this sounds right, the reality is that there are too many problems, in too many places, and too many of us to be all "working together". Put your name in the BLUE box. Instead, I invite leaders, and individual citizens, to frame a vision for solving any of Chicago's complex problems, that is big enough for many, many people to provide time, talent and dollars, individually, or in groups and collaborations. 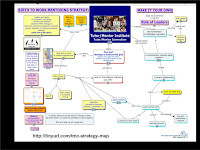 This strategy map is one vision that I'd like many leaders to adopt. If you read from the top blue box it says "my vision is".... Here's an article where I zoom into different sections of this map. 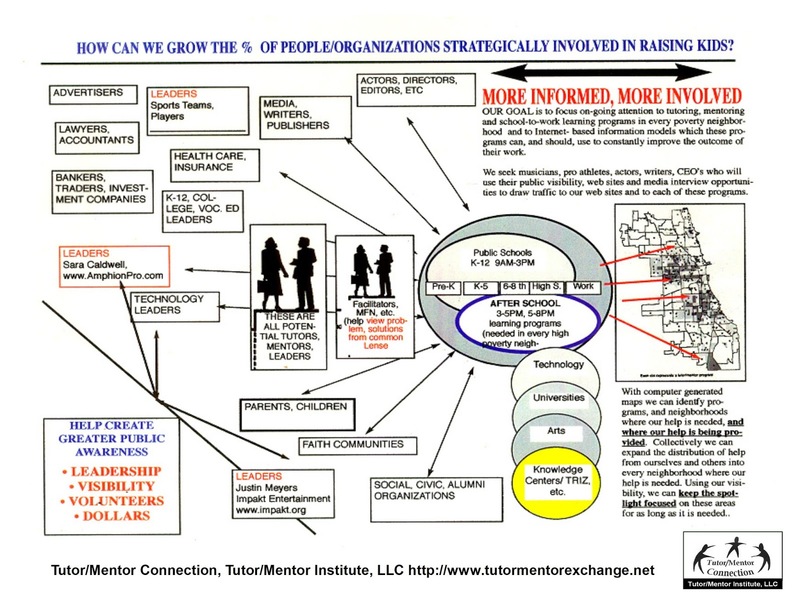 Most of the articles on this blog and on the Tutor/Mentor Institute, LLC site provide ideas that people and organizations could adopt to achieve this vision. On the right side of the above map you'll see a box that says "in comprehensive programs". If you open the link you'll see the map at the right. This shows that at every age group kids need a wide range of supports. Most of these are naturally occurring in affluent communities. Many are not readily available in high poverty neighborhoods. It's the role of organized programs to help make more of these available. It's the role of donors, policy makers and business leaders to make good programs available in every high poverty neighborhood. 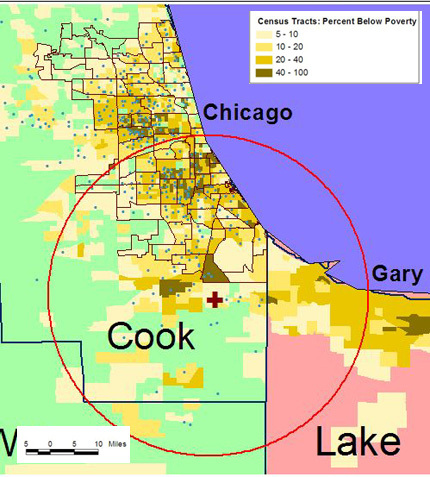 I've been using maps since 1993 to focus attention on all of the neighborhoods of Chicago (and now its suburbs) where concentrated poverty makes life difficult for youth and families. What makes "let's all work together" unrealistic is that groups of people need to adopt different neighborhoods and work to make needed youth supports available to kids from when they are born to when they are starting jobs and careers, and then until they are able to choose where to live and raise their own kids. Piloting strategies in one or two places, or supporting one or two high profile programs, leaves generations behind. We need a cavalry charge supporting problem solvers in every neighborhood, with a learning strategy that connects us in ways that we're constantly learning from each other. 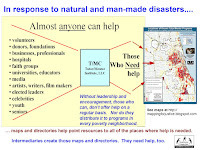 How do we mobilize and/or empower people, teams, groups, organizations, etc. to help make this happen? I wrote about this last week in this article. As a matter of face, I've written about these ideas hundreds of times since starting the Tutor/Mentor Connection in 1993 and the Tutor/Mentor Institute, LLC in 2011. Unfortunately, too few are listening and too few are helping. It's not too late. You can start reading through these articles at any time. Many say the new tax law will remove the motivation for many to make tax deductible donations to non profits. I think this is a test for our society. Do we help poor people and people with disabilities or health disparities because it's the right thing to do, or because you get a few dollars back from your donation? I've not had a 501-c-3 tax status since 2011, but I'm still doing work I started in 1993, and still dependent on others for help. Because I'm no-longer a 501-c-3 organization, my level of donations have dropped to just a few thousand dollars a year. Yet, those people who have continued to provide $100 to $750 a year have done so because of what I'm trying to do, not for the tax deduction. If you'd like to join them, click here and use the PayPal button. You can do this at anytime of the year. You don't need to wait until you're preparing your taxes. However, you don't need to support me to use the ideas I share and apply your own time, talent and dollars to help solve complex problems facing your community. 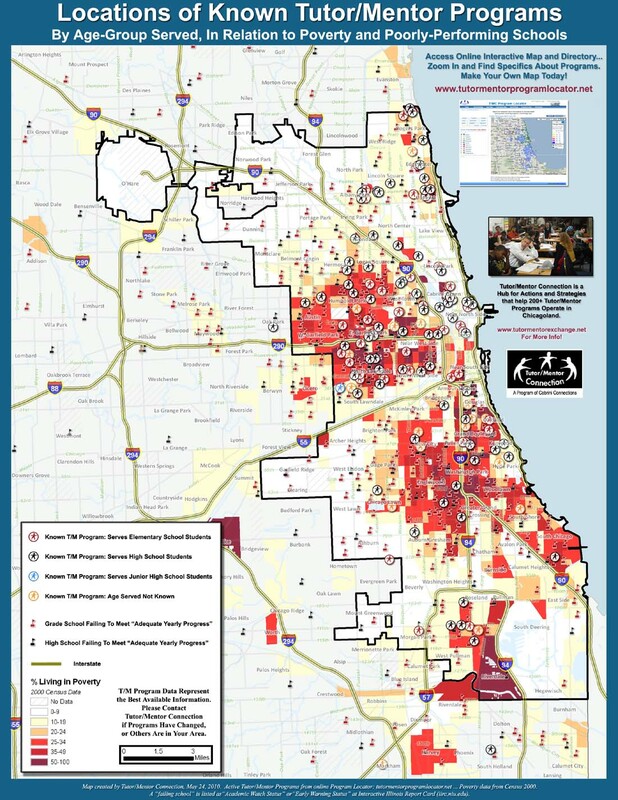 An article in the current Chicago Reporter shows how thousands of Black families are leaving Chicago, but only are ending up in the suburbs, with some of the segregation and problems of poorly performing schools that they are trying to escape. 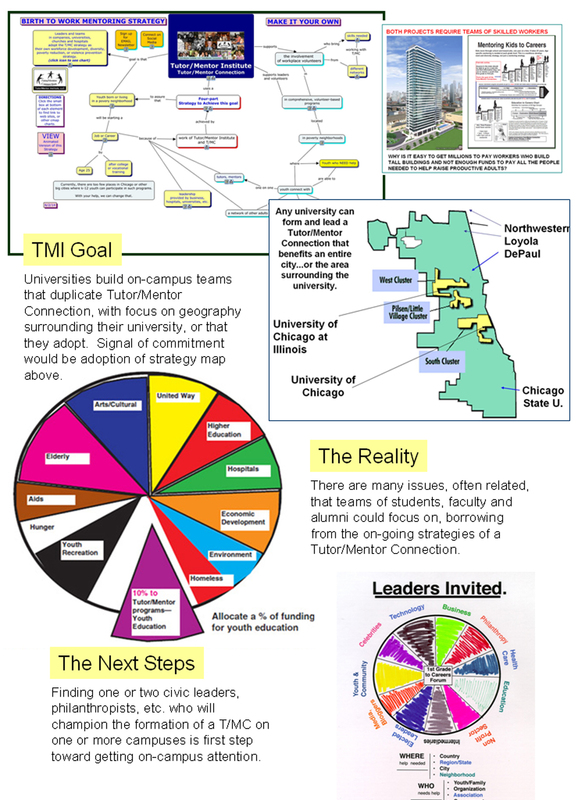 The map at the left was created in 2007 when we held a Tutor/Mentor Leadership and Networking Conference in the South Suburbs at the Olympia Fields Country Club. This article shows our goals then were to find leaders who would adopt Tutor/Mentor Connection strategies and help non-school, volunteer-based tutoring, mentoring and learning programs grow in these areas. Had leaders stepped forward to take this role the areas kids are moving to might have more support systems in place than they have now. If leaders step forward in 2018, perhaps the systems of support available in 2018 will be much stronger. It does not happen over night. There are no quick fixes. As we move into 2018 I want to focus on two ideas that I've championed for more than 20 years, but without much traction or support. This concept map shows supports kids need at each stage of schooling as they move from pre-school toward adult lives, jobs and careers. We all know how architects and engineers use blueprints to show all the work involved in building a building or an airplane. 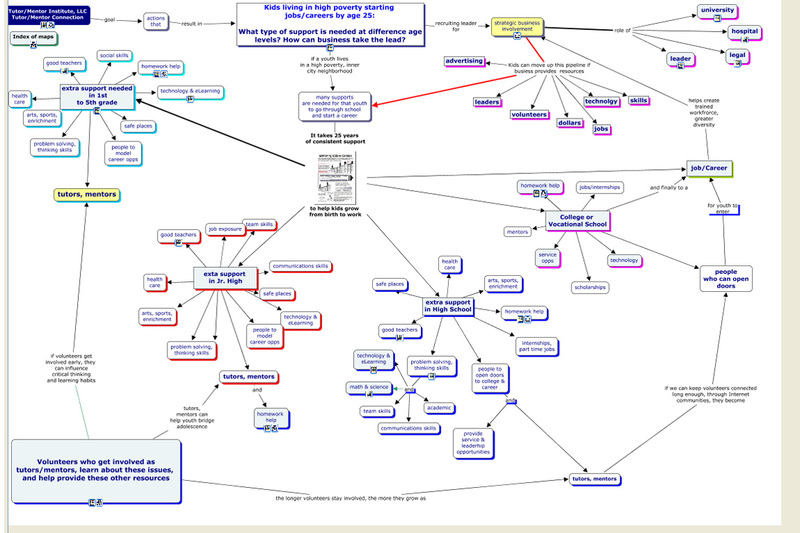 Consider this concept map a blueprint for what help kids need as they grow up. Most kids have these supports naturally within their family and community. However, kids living in high poverty have fewer natural supports, or family and community wealth, thus it's up to others to help make these supports available. 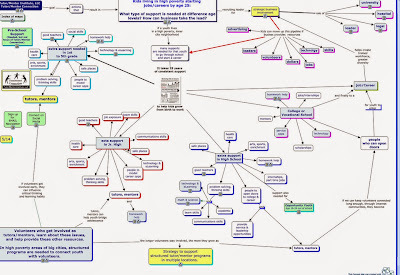 Don't agree with my concept map? Create your own. Share it. We can learn from each other. Here's the second idea. Below is a map of Chicago, created a few years ago. 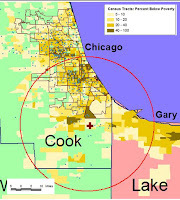 The shaded areas are high poverty neighborhoods. 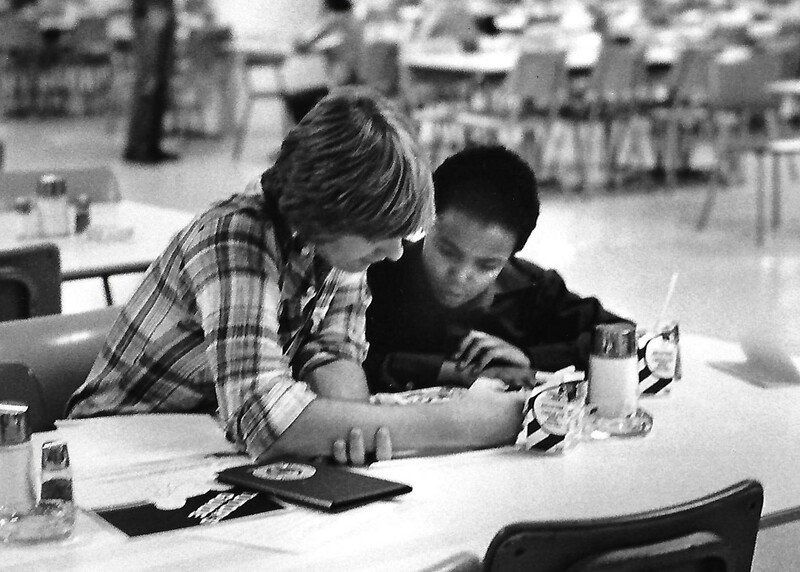 I led a single volunteer-based, non-school, tutor/mentor program serving 2nd to 6th grade kids in one Chicago neighborhood from 1975-1992 and created a second program in 1993 to help these kids move from 7th grade through 12th grade and beyond. I led that till mid 2011. 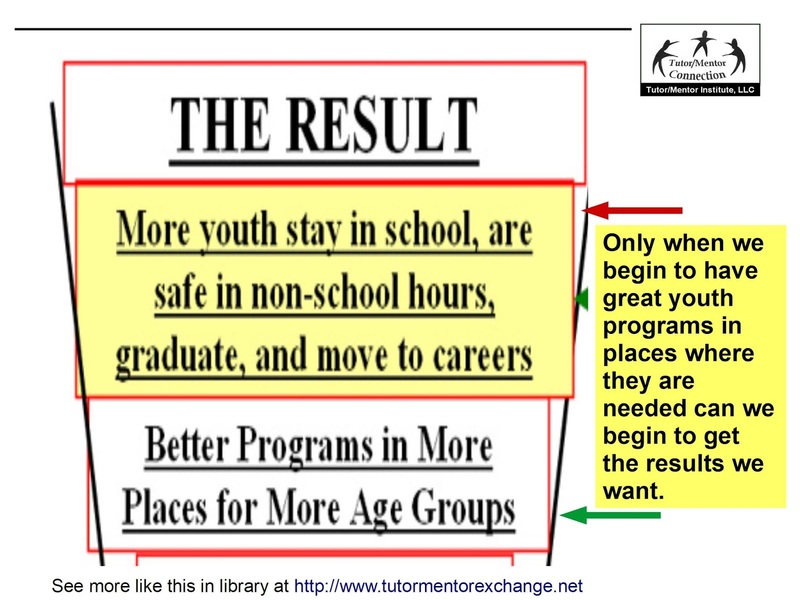 As we created the new program in 1993, we also created the Tutor/Mentor Connection (T/MC), to help our program, and similar programs throughout the Chicago area, get the resources each need to constantly improve and stay connected to youth and volunteers over a multi-year stretch. 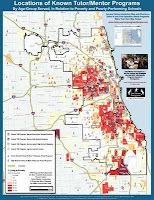 The T/MC started using maps, like the one above, to show where our single program was located, and to show where other programs in Chicago were located, using overlays of high poverty, poorly performing schools, and incidents of violence, or health disparities to show where these programs were most needed. 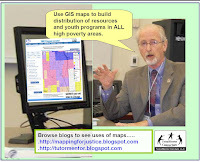 Browse articles on the MappingforJustice blog, written since 2008, to see uses of maps. 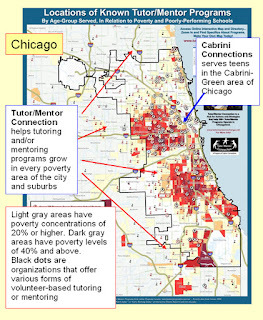 Click here to see a current map and list of Chicago area tutor and mentor programs. Here's the question I've been asking for 20 years. If we know what supports kids need, and understand how organized programs help create greater access to some of these supports (like a local grocery store provides access to fresh food), then what do businesses, foundations, volunteers, donors, policy makers and others who don't live in high poverty areas need to be doing on a regular basis to help local community leaders fill every high poverty neighborhood with the entire range of needed supports? An engineer or an architect knows that if you leave out one or two components, like wiring for the 4th floor, or a few screws in the side of an airplane, the end product is not going to work. Without building a full range of supports for kids in every high poverty neighborhood why should we expect different outcomes than what we're getting? While my maps primarily show Chicago, similar maps need to be created that show other cities and regions of the US....and the world. The only way to show that you've an answer to my question is to put a map on your web site showing where you're providing resources to support needed programs in one or two neighborhoods, or an entire city, along with a concept map, or blueprint, to show all of the supports you think will be needed as each youth moves from birth to work over a 20 to 25 year period. I've been building a web library for over 20 years with links to programs operating in Chicago and other cities, as well as links to research and to process improvement, innovation and collaboration sites. Send me links to show how you're bringing people together to discuss these ideas, or that show solutions you and others are already implementing. I'd be happy to add them to the library so I and others can learn from what you are already doing. If you value this idea and my web library and maps, become a patron and support my work. Visit this page and use the PayPal button to contribute. I read an article yesterday about multi billionaire Jim Simons and a think tank he has created to support work that benefits society. As I read it I recalled this graphic, which I first shared in this 2014 article. Simons and other wealthy people have begun setting up "institutes" where talented people work on complex problems. In Simons' case, he's not creating new raw data, but is digging deeper into data collected by others. I've been doing something similar for the past 24 years, but with less than $150,000 in my best year and with almost no money for the past six years. 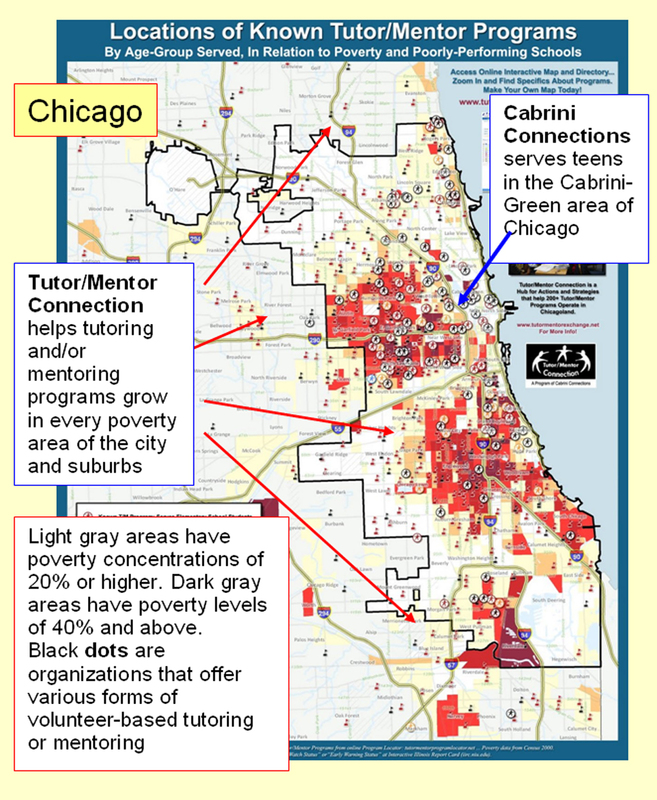 I created the Tutor/Mentor Connection in 1993 with the goal of "gather and organize all that is known about successful non-school tutoring/mentoring programs and apply that knowledge to expand the availability and enhance the effectiveness of these services to children throughout the Chicago region.". 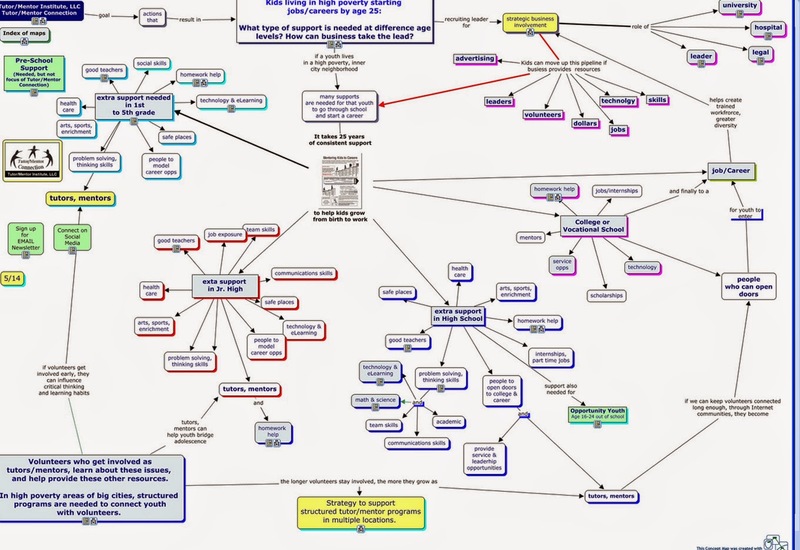 This map shows four sections of the web library I've been building since 1998. Click on the box at the bottom of any of the nodes on the map, and a new map will open, with links to sub sections of my web library. At the heart of this library is a list of Chicago area non school volunteer-based tutor, mentor and learning programs operating in different parts of the city. 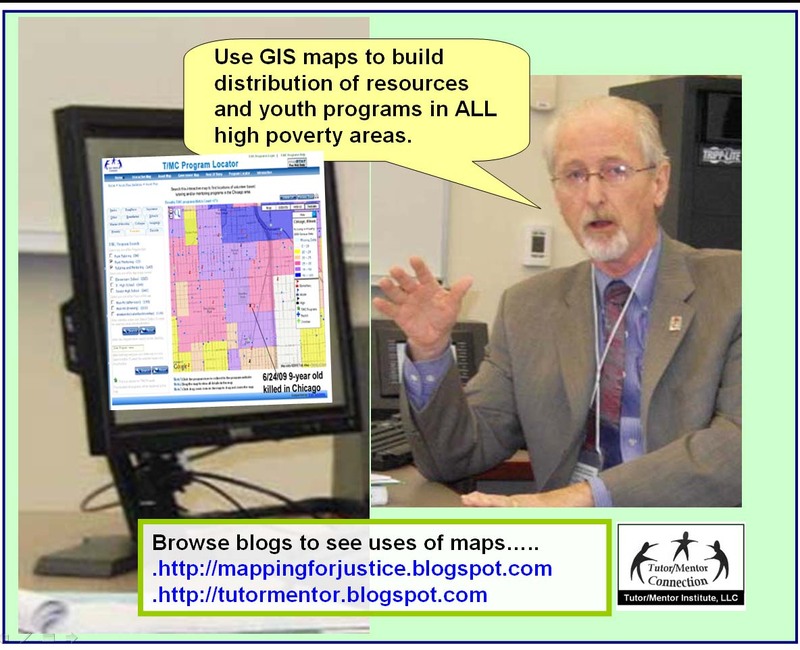 Click this link to see the map and list of programs. While I've been building a list, I've not had the resources do dig deeper into this information. 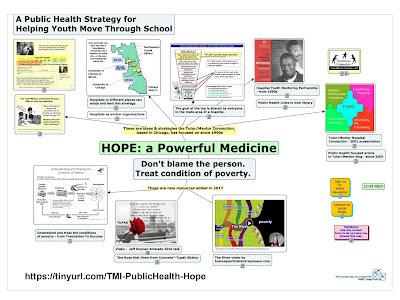 However, by sharing this online, anyone could be taking a role of building a deeper understanding of what these programs do, what works, what does not work, what could be improved, what the challenges are, how could they be overcome, etc. My Chicago Tutor/Mentor Program Locator and list of Chicago programs can be found in one section of the library I've been building. The other three sections, the larger part of the library, consists of links to articles and web sites of others involved in helping kids, or of solving complex problems. In the mission statement above I wrote "collect all that is known", which is an on-going process. We'll never have "all that is known" but we can have much more than most people have at their disposal. By aggregating this information, others can learn ideas that people are applying in some places and find ways to improve them, and apply them in many other places. When we have access to a wide range of descriptions of the problem and of potential solutions, we can make better decisions and hopefully build and sustain stronger solutions. Collecting this type of information, making sense of it, and helping others find and use it would be the role of the team that a billionaire might fund if they were to create a Tutor/Mentor Institute in their name and support it's growth the same way Simons is supporting his research institute. Collecting information is just the first step in a four part strategy that a billionaire might support, which I've piloted since 1994. In this map I show the four steps, and point to work needed to make each step work more effectively. A well funded institute could not only make better sense of the data, but do much more to recruit other wealthy supporters, and to draw resources to community led initiatives in every neighborhood who are using the information and resources to do work that helps kids and families overcome the many challenges of poverty as they move more successfully through school and into adult lives, with jobs and careers, and laws, that enable them to raise their own kids with fewer of these challenges. 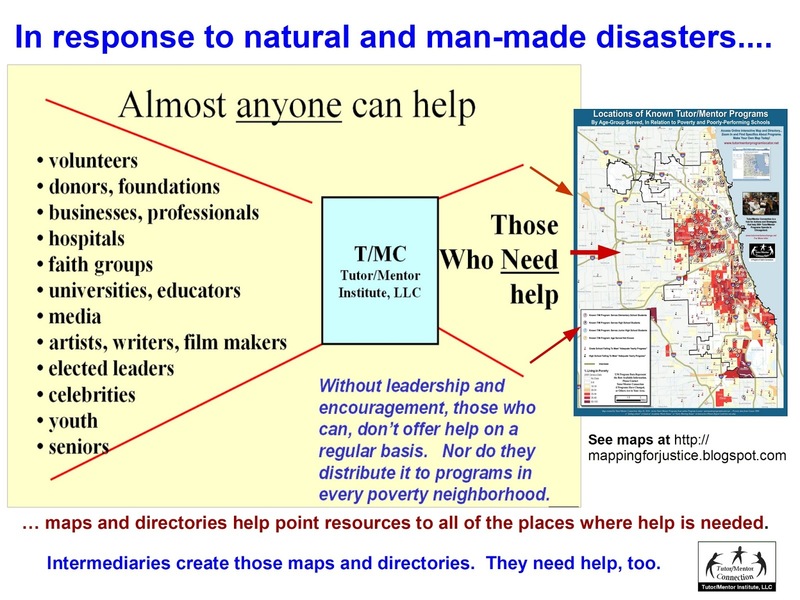 While a wealthy man or woman might create a stand-alone institute, he/she might also endow a Tutor/Mentor Institute on one, or more, college campus, where student-led teams might apply the T/MC strategy to support the growth of mentor-rich non-school programs in the area around a university, or in neighborhoods where students come from. Read more about that. A first step of any group should be to spend time reading what I've been posting in printed newsletters, web sites and blogs for the past 23 years, so they know what I'm describing and are better able to improve it over the next 20 years. 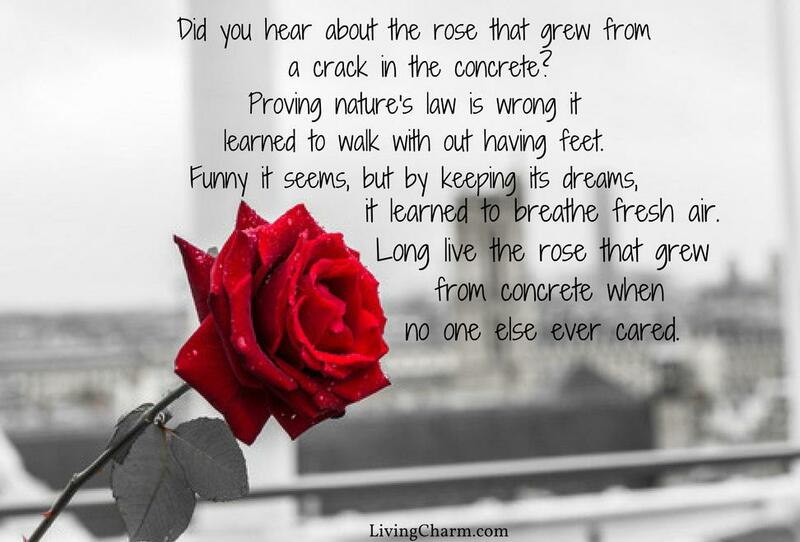 I will coach that process as long as I'm still alive. In the short term, if you want to help me, visit this page, and send a contribution. I've been sharing ideas that are intended to help volunteer-based tutor/mentor programs grow in high poverty areas for nearly 40 years. My goal has always been that the people who receive my messages will then pass the idea on to people in their own networks. If this were working effectively, people from throughout Chicago, the U.S. and the world would now be using these ideas. For the past week I've been trying to create a presentation showing how teams of volunteers from business, faith groups, colleges and national organizations like Teach For America, Rotary Club, etc. could be doing planning intended to support tutor/mentor programs in cities where members live and work. I uploaded that to Slideshare today and you can see it below. I am not totally happy with this yet. I'm sharing it with the goal that others might create their own version and tell this more effectively than I do. At the same time, I'm seeking web sites showing how this process may already be taking place in different parts of the U.S. or the world. Below is a video I created last year to show an animation done by interns in 2010-11. In the video I repeat the invitation above. Students and/or volunteers from many different places could create versions of this and other visualizations that I've launched over the past 20 years, with the same goal as I have. Interested? Make my holiday great by sending me your own interpretation of this or other articles I've posted on this blog, or by sending me links to web sites that describe how others are already engaged in this type of work. The Democracy Collaborative is hosting a Hospital Anchor Network Convening in Chicago this week. I've been interested in hospitals as leaders in building and sustaining networks of mentor-rich non-school programs in their trade areas since learning about the Hospital Youth Mentoring Network in the late 1990s. 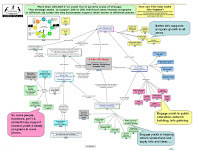 I created this concept map to point to some of the articles and resources that I've collected and shared, with the goal that hospital and university leaders would become anchor organizations, and include a Tutor/Mentor Connection component in their strategies. At the top of this map are ideas I've shared and links to articles I've posted on this blog since 2005. There's also a link to articles about the Hospital Youth Mentoring Network, which was active in the 1990s, but I don't think has been active, as a network, since about 2003. At the bottom are some new resources, from the past few weeks. One points to one page of a presentation by Marcella Wilson, PhD, who spoke at an event in Chicago hosted by Advocate Children's Hospital. Marcella talked about "Treating the condition of poverty with a client centered community based continuum of care." 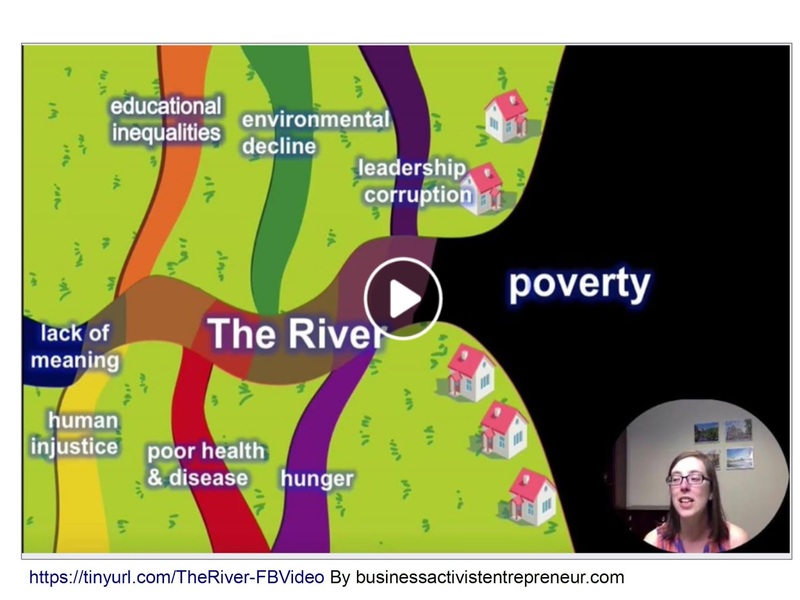 She talked about "understanding and treating the condition of poverty" using the same condition-specific practices that health care providers use. Dr. Wilson speaks of "HOPE" as one of the most important medicines we can give to the youth and adults we work with. I've a link to her book on the map. 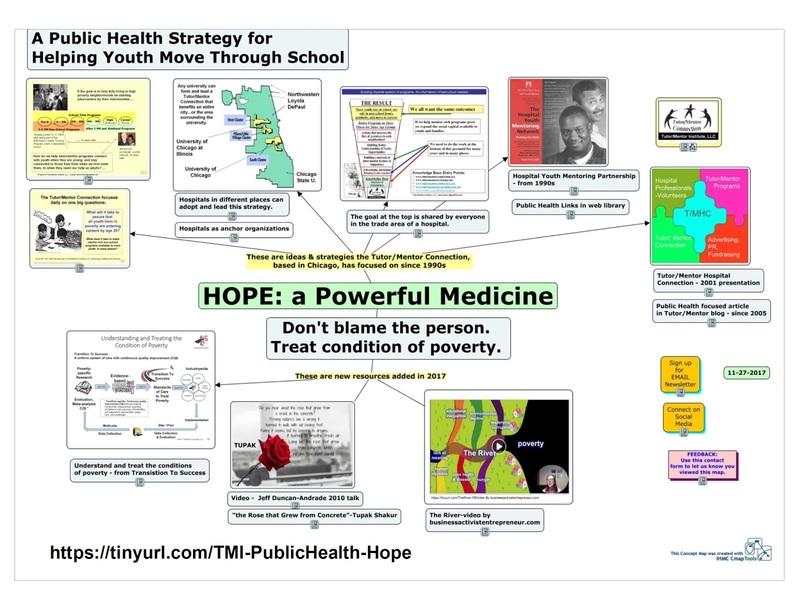 The map also includes a 2010 video, in which "Jeff Duncan-Andrade draws from Tupac Shakurs powerful metaphor of the rose that grows from concrete, as well as research in fields such as public health, social epidemiology, and psychology, and explores the concept of hope as essential for developing effective urban classroom practice." The map also includes an animated video that shows poverty as a river with many contributing streams and talks about hope, and the upstream roles that social entrepreneurs can fill, to reduce poverty and inequality and turn the river into a flow of "enough". I found it on Facebook, created by Amanda and Brandon Neely, social entrepreneurs of own the Overflow Coffee Bar in Chicago and lead a support program for social entrepreneurs. That's a lot to look at, but the condition of poverty is not something that can be solved without doing some deep thinking and on-going learning. I won't be attending the the Healthcare Convening this week due to lack of funds (and no invitation). However, my long-term friend, Steve Roussos, from Merced, California, will be attending . Steve was doing PhD work at the University of Kansas when he introduced himself to me in the late 1990s. This led to him becoming a speaker at several Tutor/Mentor Leadership and Networking Conferences between 1998 and 2002 and to creating Tutor/Mentor Connection's on-line documentation system that I used between 2000 and 2013. 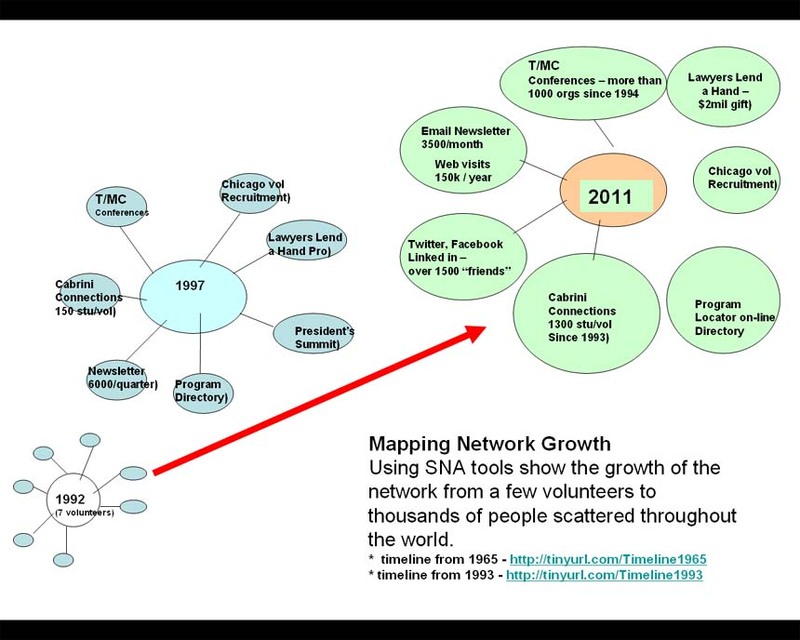 My role since 1993 has been to gather information, such as the articles I've pointed to in my cMap, then to take actions that motivate more people to look at the information, and to build understanding, via various forms of discussion and facilitation. Steve and I had dinner last night and I told him how I'd learned about on-line annotation from a network of educators who I'd been meeting on-line since 2013. I used this Jan 2016 article to show some of these annotation tools, and demonstrate their use by the #Clmooc network. Imagine if organizers of this week's event were putting presentation documents on-line and encouraging people at the event, and those who are not there, to do joint reading and discussion in the margins. That's today's #Monday Motivation from the Tutor/Mentor Institute, LLC. I've been sharing these ideas for over 20 years and wish leaders from every sector had been reading them regularly and had been applying the ideas since 1994. However, if you did not plant that tree then, now's the next best time to start. 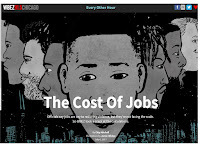 Maybe in 20 years treatment of the condition of poverty will be much more sophisticated and fewer people will be dying or losing their futures as a result. 8-26-2018 update - here's related article titled titled "Bringing Together Resources Students At Risk Need to Succeed".